Last night I watched The Rebel, part of the DVD Tony Hancock Collection and paired with The Punch and Judy Man. A slim volume, although Hancock only ever appeared in five feature films, and of the remaining three he was only cast in supporting roles. In his excellent biography of the comedy actor John Fisher examines radio and television, the worlds that Hancock conquered and made his own. Fisher even considers his achievements as a stage comedian in a new light. But sadly Hancock’s impression on the cinema is all too brief. 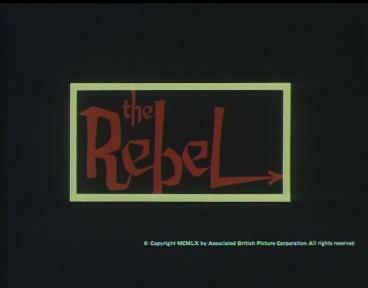 It’s thankful then that The Rebel is one of the best British comedy film of the 1960s. The Rebel essentially took the Hancock persona from television, casting him as a bored office worker who dreams of becoming a successful artist. The sad reality is that he is awful at art, producing childlike compositions of derision, known in the film as the infantile school. Travelling to Paris to find his fortune he is forced into the position of passing off the work of another artist as his own. He becomes hugely successful, but facing the pressure of having to produce more original work tracks down the other artist, only to discover that he has changed his style completely in a bid to to embrace the infantile school. These paintings also become a success. There’s also the supporting cast. Throughout his radio and television careers Hancock regularly worked with the same repertory company of actors. 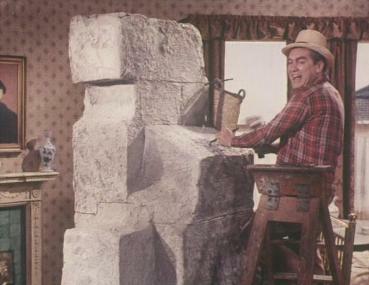 Many of the surviving tv episodes from the late 50s are a joy to watch simply because of the strength of the support. 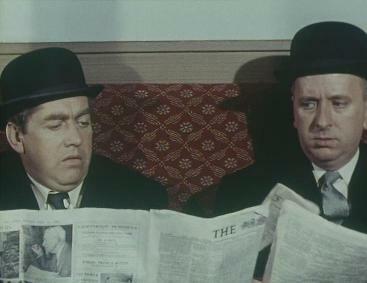 The Rebel features Hugh Lloyd as a fellow commuter, John Le Mesurier as the stiff office manager and Liz Fraser and Mario Fabrizi as workers in a cafe (“froth? I want a cup of coffee – I don’t want to wash me clothes in it!”) and they are all fabulous. Unfortunately there is no Sid James but we can’t have it all. Irene Handl is a welcome addition as landlady Mrs Crevatte (the role was played on television by Patricia Hayes). Handl is fantastic, rushing around her house with her bra straps hanging down over her shoulders. It’s here that we first witness Hancock’s “art”. “What’s that horrible thing?” demands Mrs Crevatte. “A self portrait” Hancock answers proudly only to meet the reply “who of?” “Laurel and Hardy!” he snaps in despair. 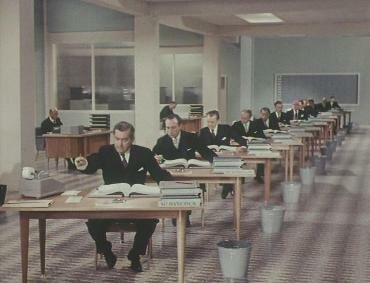 The early scenes of the film are priceless comedy. Paul Massie plays an essentially straight role as Hancock’s artist friend and George Sanders – a big star at the time – appears as an art dealer. Apparently he received a larger fee than Hancock. Dennis Price turns up as an avant garde artist called Jim Smith. Also look out for Nanette Newman and Oliver Reed in early roles. 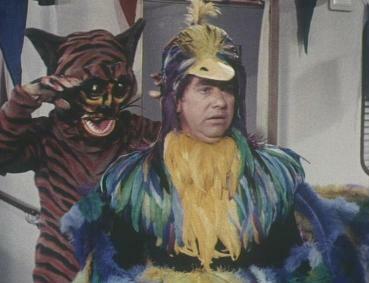 Interestingly, and unusually for a comedy film, Hancock changes gear to play the straighter scenes with Massie and does so admirably – revealing a depth to his acting that was never fully exploited. In this sense, together with its international flavour, the Rebel anticipates many of the later caper films of the 60s, where comic and straight actors played together in expensive looking European locations, for example The Pink Panther. The DVD features commentary by writers Ray Galton and Alan Simpson together with Hancock enthusiast Paul Merton. 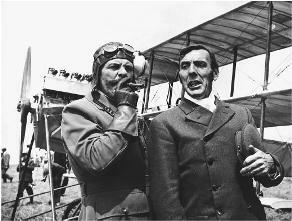 In many ways the commentary makes the film funnier, with the trio often falling into fits of laughter, especially in the scenes between Hancock and Handl. It’s like watching with a gang of obsessive friends, and there are many fascinating anecdotes I’d never heard before, such as the time Hancock embarked on a two day bender whilst garbed in the paint splatterd pyjames he wore after filming the “Jackson Pollock” scene. A highly enjoyable experience. Incidentally, Galton and Simpson also confess to writing far too much material for this film; even after they edited it down it is still a trifle overlong, but I’ll forgive them for that. Who wouldn’t? In 1967, Peter Cook and Dudley Moore were the BBC’s shining comedy stars. It’s difficult to judge now just how popular they were thanks to the Beeb’s crazy decision to wipe the tapes of most of their Not Only, But Also series. 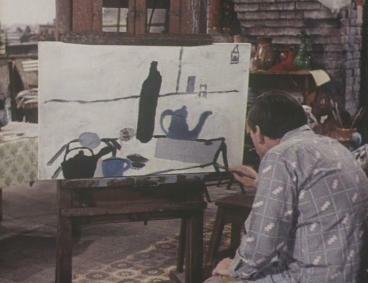 As a team, Cook and Moore’s achievements are now best marked by the few sketches that do remain from the black and white shows and from the cult Derek and Clive recording that came much later. Peter Cook is now probably best remembered for, well, simply being Peter Cook – amusing and often tipsy on numerous chat shows. But 1967 was also the year of their finest achievement. The brilliant comedy film Bedazzled. Typically for a 60s upgrade from television to film, Bedazzled is colourful, expensive and made to last. Perhaps Cook and Moore were aware that their television exploits were soon to be binned (rumour has it that Peter Cook wrote begging letters to BBC chiefs in the early 70s to save his old shows from the skips lined along Wood Lane), and wanted some cash thrown at their talent. But unlike many comedy films adapted from tv in the 60s, and especially 70s, Bedazzled is far above average. This is possibly because, different to the situation comedy, Cook and Moore’s humour was sketch based. But unlike Monty Python’s lazy And Now For Something Completely Different, which simply refilmed a series of television sketches for the big screen, Bedazzled creates an interesting and inventive frame for the sometimes unrestrained humour. 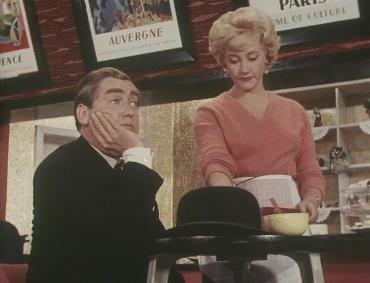 Moore plays Stanley Moon, a hapless cook in a Wimpy bar, besotted by a waitress (played by Eleanor Bron). 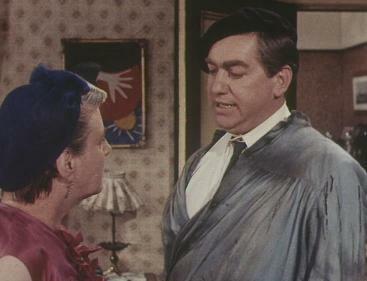 He meets a George Spiggott (aka The Devil – Peter Cook), who grants him a series of wishes in order to allow Stanley to win his girl. This is the framing device, and Cook (who wrote the screenplay) creates a way to easily weave together what is essentially a series of short sketches. Some of them don’t work so well, although the ones that do are hilarious (Moore as a raspberry blowing trampolining nun is the funniest thing they ever did together). It’s all far from the satire often associated with Cook’s humour, although when he does attempt it – such as the spoof of 60s bands – it’s brilliantly spot on. Bedazzled sometimes comes across as a film that’s been engineered to look like it belongs in the swinging 60s. There are the glimpses of routemaster buses and red post boxes, and what always fascinates me about films made in London in this period is the locations. Bedazzled depicts London as half building site half modern office block (the Post Office Tower features heavily in one scene). And oddly, like most of the location shooting from tv’s The Avengers, the streets are empty and devoid of extras and traffic. London is depicted as eerily empty and hassle free. In one scene Cook and Moore pretend to be traffic wardens, although the pre-congestion charge London of 1967 looks like a city where parking is never a problem. It’s worth seeing Bedazzled for a record of Cook and Moore at their peak, before the respective boozing and lure of Hollywood got in the way. Raquel Welsh also makes a cameo appearance, as does Barry Humphries, and Moore wrote the theme music. Possibly it’s tongue-in-cheek music, but it’s as good as anything from similar films of the period. Just watch out for the migraine-inducing effects that accompany the opening titles. Incidentally, it’s directed by Stanley Donen who’s probably best known for Singin’ in the Rain. Peter Cook and Dudley Moore went on to appear together in the films Monte Carlo or Bust and The Bed Sitting Room, both made in 1969, although these were more ensemble pieces. The first a caper movie, the second more of a Spike Milligan vehicle. In 1978 they got back together for the coarser-humoured Hound of the Baskervilles. 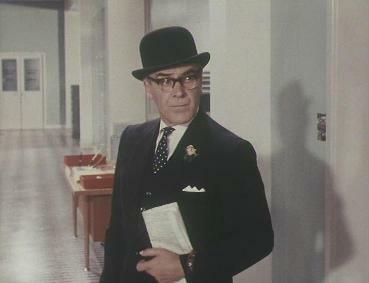 As a solo performer, Cook appeared in several films including the spy thriller A Dandy in Aspic (1968) and The Rise and Rise of Michael Rimmer (1970) which he co-scripted with John Cleese. But he was never much of a varied actor, and Moore was left to pursue a much more successful, if ultimately irritating, film career. Bedazzled is by far the best thing both of them were involved in on the big screen. The script is very well written and it’s a witty and, most of all, a very charming film. And a reminder that they were a very charming and likeable double act. How long before Bill Nighy turns up on screen in a British comedy? In Hot Fuzz it’s exactly four minutes. A little longer for Jim to make an appearance, but he’s there within half an hour. Wells is doubling for a fictional country village, with the usual fetes and village greens. The soundtrack includes Village Green Preservation Society and Village Green by The Kinks. Hmmm, not very original. Hot Fuzz explores the fish out of water scenario. An outstanding London policeman is promoted to Sergeant but relocated to work in the country. There he must adjust to the quieter pace of life and the eccentric ways of the locals. In many ways it is similar to the TV series Life on Mars, with the strange country life being just as alien to the hero as being stuck in 1973. My games aside, I enjoyed Hot Fuzz very much until about half an hour from the end when the film decides to dance through as many film genres as it can. It’s a very funny comedy, but it just goes mad. 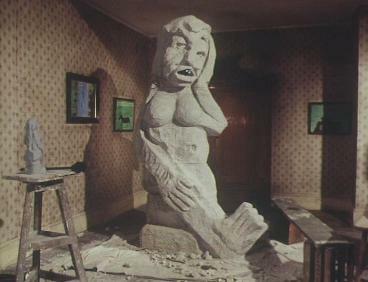 There’s horror suddenly thrown into the mix, with violent murders taking place, and for a moment I thought it was going to descend into either The Wicker Man (there’s even a cameo from Edward Woodward) or The Hills Have Eyes. Eventually it settles for being a buddy-buddy cop film with cartoon gun battles. Not bad, but I would have preferred more of the gentle comedy and more use made of the excellent supporting cast who include Paddy Considine, Kenneth Cranham and Billie Whitelaw. Apparently the team who brought us Shaun of the Dead and Hot Fuzz are working on a third film already. They haven’t revealed what genre they’ll be tackling, although I’ll still be playing my games when I go to see it.